this is soooo cute- doesn't feel great to make a dent (no matter how small it is) in our stash? Beautiful!! LOVING the bright colors and love love love the giraffe embellie!! Great background paper to use with the theme :) And OMGosh! love that giraffe - so stinkin' cute~!!! LOL! What a great photo!! I just love all of the details on this layout! So fun!! The giraffe makes me smile too! I have been doing the same and pulling out really old stuff and putting it to good use. What a fun photograph! Love your layout! Great layout and congrats on the publication! Love all the stitching details! Awesome page - you made old stash look totally new. Congrats on the pub! This is FANTASTIC! I love that picture. What a rich and fabulous page Lisa! Great pic and such a fantastic layout! Love your layering on this page Lisa! Great photo and wonderful embellies! Just adorable...i bet it is an awesome album! Lisa, this lo is so adorable! I like how colorful it is and the great picture too. Nice work! What a fun colour combo! 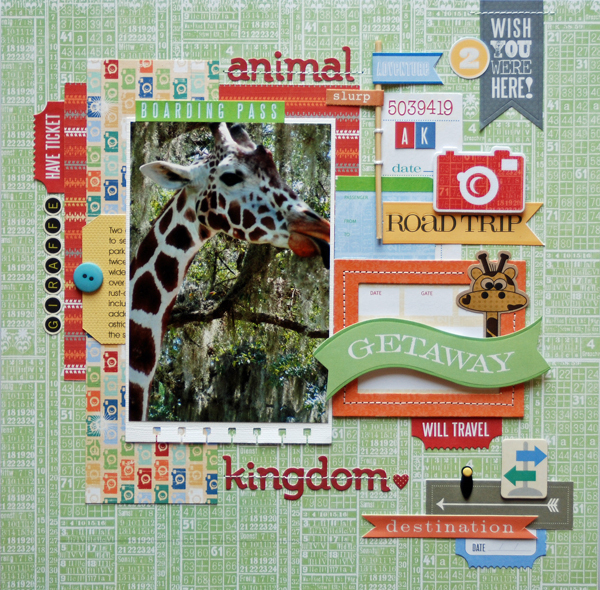 Fabulous design of your layout and love that giraffe die cut! What a fabulous page!!! Love all the details ... there's so much to see!! Just bought the "just because" collection but now I want this collection too!! 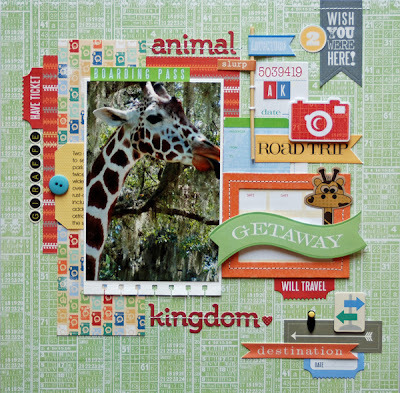 I love this non-traditional use of Escape on an Animal Kingdom page. What a great photo. That cute little giraffe sticker is killing me. Great layout. Congrats on the pub!